Creativity doesn't always just happen. In the Western world especially, where processed and packaged stuff is available everywhere all the time, it's much easier to consume rather than to create. Both are essentially the same in this — it's food, and I ate it. Done. But the two are essentially different in this — in the first example, I had a lot of creative input in the food that I ate. I created it from the raw materials I had on hand. In the second scenario, I didn't. I ate what had been produced and packaged for me. There are times — many, many times — when using what has already been produced is much smarter than trying to create your own version. I don't want to build my own house, I just want to live in it. So let me be clear — we're not on a mission to be creative all the time, in every aspect, in every possible way. Quite the opposite, in fact. 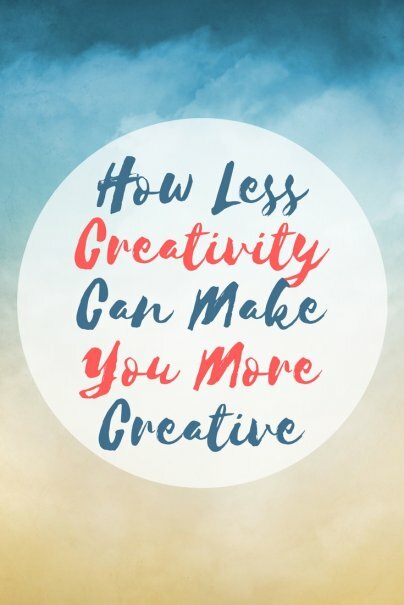 It behooves you, if you want to be more creative, to find some key ways to be less creative. Wha-aaa…? Looks of confusion around the room. Your day-to-day life is a series of tiny decisions and repetitious acts. You wake up every day, get dressed, eat breakfast, get in your car, and drive to work. Or you wake up every day, get dressed, snuggle with some cute little kids, come up with breakfast for you and the cute little kids, clean the house, and do some work. Whatever your life consists of, chances are you repeat a lot of your actions day after day. Yes, I am. Let's continue. So you do a lot of the same things every day. You either make the same decisions over and over again, or you do these same things out of habit. You put a few habits in order, and you have a routine. Routines get you through your repetitious daily tasks and save you from making the same decisions over and over again. And when you're not using your time and energy to decide (again) what you'll wear or whether you'll wash your hair or when you'll work out, you can use your time and energy for other stuff instead. Consider this — you deal with thousands of decisions every day. You know from experience that your mental energy is limited. All of us can process only so much before our brains go on auto-pilot or shut off completely. If you know your mental juice is limited, why do you want to waste it on the stuff that isn't so important? Put some of your life on auto-pilot so that you have more of your mental capability to put into your creative passions. The routines you build may seem to give you less room for creativity, and they do in a certain sense. When you have routines, certain parts of your life are already decided; all you have to do is follow the routine, and the results will follow without any real creative effort. But putting those routines in place gives you the freedom to be more creative in other areas. Agree. Routines are a must. Efficiency in getting "chores" done allows for more creative "fun" time. For those of us who are not global thinkers, lists are helpful too. I like to estimate the amount of time each task will take and put one in a free time slot. And I like to plan for a little "fun", once a good chunk of work is done. Yep, you nailed it! Routines help us get quickly through the daily "grunt work" so we can put more time, more energy, and more of ourselves into the more important work - whether that's being creative, building a side business, being with our family, or having some fun. But how can you say no to fresh fritattas and crepes? Ha! I know, I know, fritattas and crepes... I guess there's always a trade-off. It's counter-intuitive but so true! I've been in the military for 25 year and I've always said the military freed me to be my most creative self. What to wear, how to behave on the job, how to be successful in my company, etc. is all on auto-pilot, so my brain is free to focus on what's really important and interesting. I just retired this month and the number of trivial decisions I now have to make is overwhelming--just getting dressed in the morning can be a pain! I'm on the hunt for new routines. Good luck on the hunt. I've found that I do better to just come up with very basic routines, get in the groove, and then tweak and perfect as I discover what works or doesn't work about them. Thanks for your military service, too, for so many years.